The Blue Ridge Music Center is working on a permanent exhibit which will trace the history of the music of America through the Blue Ridge region. The contemporary perspective includes primarily bluegrass and old-time. The design team has come up with the concept of a large three-dimensional cube which allows for the display of some thousand or more CD covers. Part of the story involves how the music has gone all over the world - both in terms of musicians from here traveling and musicians in various countries learning to play bluegrass and old-time. They are looking for CD covers going back to the Bluegrass 45 on Rebel Records and everything since then. Unfortunately, they do not have the ability to display LPs. They are interested in music of non-American bluegrass groups, preferably released in countries other than America. If people wish to send items (just need the jacket) it would be to Blue Ridge Traditional Arts, P.O. Box 1010, Galax, VA 24333. The project will be the permanent exhibit for the Blue Ridge Music Center on the Blue Ridge Parkway outside Galax. Here is a bit of text from website. The Blue Ridge Music Center celebrates the music and musicians of the Blue Ridge. Established by the U.S. Congress in 1985, the site includes an outdoor amphitheater and an indoor interpretive center used to highlight an important strand of American musical culture, which is still alive and thriving in the region. The site is operated through a partnership between the National Park Service and the National Council for the Traditional Arts. The permanent exhibit will open in summer 2010. Lori Aratani's article 'A new crop of farmers' in the Washington Post of Sunday 28 June 2009 highlights a new generation of women farmers in Maryland and Virginia, USA. Julie Stinar of Evensong Farm in Sharpsburg, Maryland, who formerly worked in the fashion business, is the first example given in the article and appears often in the accompanying photos. She is also the daughter of bluegrass bassist and IBMA Hall of Fame member Tom Gray, who played in Europe earlier this year as a member of JB's Band. The above photo of Bluegrass Cwrkot (CZ), taken by Jan de Mooy at the EWOB Festival 2008 in the Netherlands, is wanted for showing on the Japanese cable TV channel WOWOW. The photo, which appeared on the Bluegrass Blog on 14 May 2008 and on the European Bluegrass Blog two days later, is now on the home page of Bluegrass Cwrkot's website. The band's performance at Voorthuizen that year won them the #1 Audience Popularity Award. Congratulations to Jan de Mooy and Bluegrass Cwrkot on helping to strengthen the international ties of bluegrass music. The programme is scheduled for broadcasting throughout Japan from 10.00 a.m. on 5 July. On 24 June writer and publicist Dee Hallett (UK) announced that she would be bringing to an end her regular e-newsletter Bluegrass & MORE in order to spend more time with her family. For years, Bluegrass & MORE has presented on a weekly basis news on bluegrass, old-time, folk, and related music in Britain and Ireland, Continental Europe, and the US. The European Bluegrass Blog is among its innumerable beneficiaries. Dee has also been a mainstay of the magazines Country Music Roundup, Country Music Dance, and British Bluegrass News. Today Dee issued her 'swan song' - the last Bluegrass & MORE compiled by herself. However, Bluegrass & MORE will continue to appear in its familiar form, thanks to the committee of the Scottish Bluegrass Association (SBA), who have offered to take on the editorial duties. Dee will act as a consultant and associate to the SBA till the transition is complete, but will not be involved in final editorial content. Under the Data Protection Act, Dee cannot pass her mailing list on to the SBA. Anyone wishing to receive Bluegrass & MORE, therefore, should e-mail the SBA with 'ADD Bluegrass & MORE' in the subject line. The SBA are similarly bound by the Data Protection Act not to divulge details to any third parties. All news intended to appear in Bluegrass & MORE should also be sent by e-mail to the SBA. Hayseed Dixie (USA) will be playing in western Europe during July and August 2009. Confirmed dates on the band's schedule include ten shows in England, Scotland, and Wales between 17 July and 10 August, followed by appearances at the Pukkelpop Festival, Hasselt, Belgium, on Saturday 22 August, and at Carrickfergus Castle, Carrickfergus, Northern Ireland, a week later. Thanks to Lilly Pavlak for these photos of George William 'Bill' Harrell, taken at IBMA's World of Bluegrass 2008, when he received a Distinguished Achievement Award. The picture below shows him with his friend Larry Stephenson, a former member of Bill's band, the Virginians. Bill Harrell suffered a stroke on Friday 12 June, and died at home on Wednesday 24 June. Viewing will be on Sunday evening, 28 June, from 6.00 to 8.00 p.m. at Chesapeake Christian Fellowship Church, Central Ave., Davidsonville, MD. The funeral will be at 10.00 a.m. on Monday at the same church. Condolences may be sent to 938 St George Barber Road, Davidsonville, MD 21035. The original Bluegrass Blog's post of 19 June includes some fine footage of Bill Harrell, Don Reno, and the Tennessee Cutups on the Porter Wagoner show in 1968. Following our post of 17 June, Lilly Drumeva of Bulgaria reports that five performances from the Budapest concert on 13 June have now been added to the thirty-eight already on her YouTube channel. The songs featured are 'Nelly Kane', 'Molly and Tenbrooks', 'How mountain girls can love', 'Can't you hear me calling', and 'Sto mi e milo'. The new videos show Lilly (guitar, vocals) with Slovak musicians Lubos Yurkovic (guitar, vocals), Michal Barok (mandolin), Peter Szabados (resonator guitar), Richard Cifersky (banjo), and Anton Naroda (bass), as shown in the photo above. Followers of the early bluegrass scene in Europe, namely Germany, might enjoy reading this article. Rolf and Beate Sieker are bluegrass music artists from Berlin, Germany now living near Austin. They met at a bluegrass festival in northern Germany in 1983 and have been playing music together ever since then. Their deep love for bluegrass music inspired them move to the U.S. in 2000. Texas now is their home. A balmy evening in Budapest, Hungary, was the setting for a special bluegrass concert on Saturday 13 June 2009. For the first time, such a concert was organized by two countries – Slovakia and Bulgaria - and took place in a third one – Hungary! This shows how bluegrass music brings people together! Beginning at 7.00 p.m., Lilly (guitar, vocals) and musicians from Slovakia - Lubos Yurkovic (guitar, vocals), Michal Barok (mandolin), Peter Szabados (Dobro), Richard Cifersky (banjo), and Anton Naroda (bass) - performed bluegrass, Bulgarian, and Slovak songs on a specially built stage in the garden of the Slovak cultural institute in Budapest. The multi-national audience included members of Hungarian bluegrass bands Acousticure and Another Ground. Read Lilly's full report, with photos taken at the event, here. Music has historically brought us through hard times, bringing enjoyment to those who play it and to those who listen. What better way to lift spirits and create a sense of community? Homespun Tapes continue to make their massive catalogue of prime instructional material available in innovative ways. The new Homespun Instant Access Delivery System makes it possible for anyone with a high-speed internet connection to receive a Homespun DVD and tab/music booklet delivered directly to their computer, with no waiting or postal charges. More information is here. Keep in touch with Homespun Tapes for future offers. An article on Homespun by David McCarty appeared in the March 2009 ('Instruments') issue of Bluegrass Unlimited. The Czech bluegrass community includes many admirers of the Stanley Brothers. In 1996, thirty years after the death of Carter Stanley, two of these admirers - Jarda Dvorak and Mirek Kalousek of The Log band - organised a very successful memorial concert in the village of Seloutky, with eight bands playing Stanley Brothers music. Ivo Drbohlav's report of this event appeared in Banjo NewsLetter, xxiv, no. 4 (Feb. 1997), pp 20-21. Since then it has become an annual festival held in several locations, most often in the U Starého Rebela ('Old Rebel Saloon') in Sloupnice. This year's event will be held there on 28 November 2009. Thanks to Lilly Pavlak for this information, for the above image of the 2008 festival poster, and for the photos showing Jarda Dvorak in 2006 receiving his European Bluegrass Pioneer Award (above right) and a picture of Ralph Stanley (below) at the La Roche Bluegrass Festival in La Roche-sur-Foron, France (Christopher Howard-Williams, festival organiser, is at the microphone). This year, cold weather and heavy rain forced the 18th Strakonice Jamboree to leave its usual beautiful outdoor setting and move into shelter in the differently beautiful House of Culture (photo, right: Blackjack on stage). Over thirty bands took part during the two days, including G2 (Sweden) and New River Train (Austria) as well as many leading Czech bands. With the shelter of indoor conditions, jamming went on till dawn. Highlights of the event included an appearance by a finalist of the 'Czech superstar' TV contest – the former Modrotisk banjo player Ondra Ruml (2nd place) with the Eliska Ptackova band (photo, below left) - and the presentation to Blackjack of the #1 Audience Popularity Award which they had won at the EWOB Festival in the Netherlands. Thanks to Lilly Pavlak for a report and many fine photos taken at the Jamboree. Links to the programme and other details were published on the European Bluegrass Blog on 7 May. Lilly's full report can be read here. Update 15 June: More photos by Lilly can be seen here. Thanks to Roberto Dalla Vecchia ('Flatpicking Guitar with Italian Gusto'), of Vicenza, Italy, for his E-Newsletter for June 2009. Roberto's four-day acoustic guitar workshop (30 May-2 June) was very successful, and next year's event is planned for five days (2 June-6 June 2010), with a special guest flatpicker attending. Legendary guitarist David Bromberg, with his wife Nancy on bass, played a concert recently in Vicenza with Roberto (photo above; other photos here). Roberto also toured in the north-eastern USA with Mark Cosgrove in May; they composed a tune together for Mark's next CD. The May/June issue of Flatpicking Guitar Magazine is devoted to fiddle tunes, and gives easy and advanced versions for many jam session standards. Roberto's arrangement of 'Turkey in the straw' is included. The issue can be bought as hard copy or as a downloadable pdf file, here. Roberto's latest CD, Unknown legends, continues to receive high praise from reviewers and listeners. Soundclips for all the tracks can be heard here. His next concert will be on Sunday 28 June 2009 in the Cortile del Municipio, Cressa (NO), Italy, at 21:00. Online info here. Roberto is also on MySpace. For more details, see the Festival website and MySpace site. You can also join the Picnic Festival Group on FaceBook. In 2009 the vigorous old-time, bluegrass, and related music scene in Portland, Oregon, USA, has already exported to Europe the Foghorn Duo (plus Nadine Landry on bass), the Flat Mountain Girls, and Huck Notari. 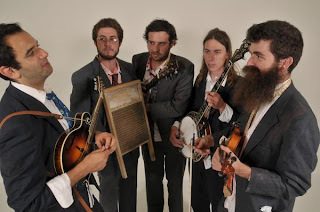 The latest from Portland are the Water Tower Bucket Boys (above), touring in Britain from 27 July to 9 August to mark the release of their second album, Catfish on the line. The Water Tower Bucket Boys, formed in 2005, are Josh Rabie (fiddle, guitar, banjo), Kenny Feinstein (guitar, mandolin, harmonica), Cory Goldman (banjo, guitar), and Walter Spencer (upright bass). As is common with bands from the Portland scene, they have a lot of experience in playing for dances. Their first album, The squid and the fiddle, combined old-time tunes with bluegrass classics done with a rough-and-ready old-time feel. Each member of the band contributed original material to Catfish on the line, and their next album is planned to be all-original. The band is also on MySpace and other internet media. Their tour is managed by G Promo PR, who can be contacted by phone (+ 44 (0) 1691 622356; mobile + 44 (0) 7855 724798) or e-mail. The 24th annual acoustic music classes held in Virton, Belgium, got under way with everyone in good spirits. For the seventh consecutive year, Jean-Marie Redon led the banjo workshop. This year saw a fine crop of dedicated students who put on a fault-free recital to mark the completion of classes. As for their instruments, there was a Fender, two Odes, a Kapek, a Stelling, an Ida, a Goldtone, a Coufleau, a Washburn, a Framus, and two Celtics. And here's a photo of the same in the company of their happy owners. Preparations are already under way for the 25th edition of Virton, which will indeed be special. For more information, visit this link. No sooner had he returned from Belgium than Jean-Marie set to organizing a workshop for his banjo students with the great Alan Munde. La Grange Rouge [in La Chapelle Naude], an association devoted to all forms of traditional music, had invited Alan, Byron Berline, and Jim Hurst to give a master class and concert on Easter week-end. Alan wanted to spend a few days in Paris with his charming wife Kitty, and Jean-Marie saw an opportunity to expose his students to one of the masters of bluegrass banjo. The workshop took place at the Maison des Jeunes et de la Culture in Ris-Orangis, near Paris, with over a dozen participants. James Field, who plays guitar in Jean-Marie's bluegrass band, Blue Railroad Train, provided rhythm backup during Alan Munde's demonstrations. More information and photos are on the Redon-Lombardi.fr and ActionBanjo.fr websites. Trnava (SSPC 000002), the latest CD by resonator guitarist Ferrell Stowe (USA) is named for the city and region of the Slovak Republic, where the dobro guitar and its historic origins are celebrated in the Dobrofest. The twelve tracks include eight original numbers (including 'Return to Trnava' and the song 'Death from Nashville causes'), with guest vocals by Carl Jackson and Toni Otts, and fine pickers from the Nashville bluegrass community. The album is reviewed by Bill Wagner in the May 2009 issue of Bluegrass Unlimited. Lilly Pavlak reports that during the recent Strakonice Jamboree in the Czech Republic, the news came that the legendary Czech country singer Waldemar Matuška had died at his home in Florida, USA, on 30 May at the age of 76. The audience honoured his memory with a minute's silence and the singing of one of his trademark songs. A multi-instrumentalist known mainly as a banjo-player, 'Walda' was enormously popular, and in a long career made some thirty albums and starred in over twenty films. He toured overseas with his band K.T.O. and emigrated to the USA in 1986, revisiting his homeland frequently after the fall of the communist regime. His last wish was to be buried in the Czech Republic. A farewell ceremony will be held in Prague later this month. Read a full report by Lilly here. The above photo of Laurie Lewis & the Right Hands was taken by Karl Heinz Siber during the band's recent tour in Europe. It is reproduced in Laurie's June e-newsletter, but has not yet got on to her website. Richard F. Thompson, a leading figure in bluegrass journalism, has become editor of British Bluegrass News, the quarterly journal of the British Bluegrass Music Association (BBMA). Richard combines the expertise and drive of a journalist (he has described himself as a 'news hound') with a wide and deep knowledge of bluegrass and its history. He was one of the first members of the BBMA, and was editor of the BBN in the 1990s. He has also for many years been involved with international aspects of bluegrass, having been a member of the panel for the International Bluegrass Seminar at the IBMA's World Of Bluegrass 1998 at Owensboro, KY. The March 1994 issue of BBN carried a story by Richard with the then-original title of 'The "I" in IBMA', mentioning many of the activities that made up the IBMA's international dimension. He has contributed many news items and features to the original Bluegrass Blog since it began in 2005. When the BBN was reorganised and relaunched last autumn, Richard (as features editor) personally wrote an impressive amount of the first issue. As editor, he intends to assemble a team of contributors to do most of the actual writing, and will be looking for stories beyond the borders of Britain itself. He can be contacted by e-mail. In addition to their fine website, which indicates the wide range of programmes they offer for different occasions, Suzanne and Jim now keep a blog. Contact them through their website's contact page. The Hot Seats (USA) from Richmond, VA, 'Richmond's Beloved Absurdist Stringband' and formerly known as Special Ed & the Shortbus, will be touring in Britain and Ireland from 21 August to 4 October. Most of the dates are in Scotland, beginning with the Mull of Kintyre Festival; but they will be in England and Wales in early September, and will be playing three dates in Ireland later in the month. Full details are on the band's tour schedule. The Hot Seats are also on My Space, YouTube, and other parts of the internet. Bluegrass is represented on the main concert stage by Carrie Hassler & Hard Rain (USA) on Saturday evening and the Toy Hearts (UK) on Sunday afternoon. Tennessee Stud (F), with Christian Labonne back on banjo, will be taking part in a programme of free concerts downtown. You can download the flyer and make reservations for the Country Rendez-Vous through its website. Thanks to Radio Country Club (also on MySpace) for the news; Radio Country Club is a partner of the Country Rendez-Vous. Carrie Hassler & Hard Rain are also scheduled to play in Geneva, Switzerland, on 29 July (TBA), and at the La Roche Bluegrass Festival at La Roche-sur-Foron, Haute Savoie, France, on 31 July. The 3rd Westport Folk & Bluegrass Festival will be held in the attractive small town of Westport, Co. Mayo, in the west of Ireland, from Friday 26 June to Sunday 28 June 2009. Heading the lineup are the Blue Grass Boogiemen (NL), who have been favourites at festivals in Ireland since 1997. The programme for the festival is now available as a flyer, and the outside and inside can be seen at these links. For us, the grant will provide funding to be used for travel expense to the UK. While in the UK we will be meeting with several new dealers and case manufacturers in an effort to broaden our export reach. The newsletter also mentions the favourite links listed on the website of guitar ace and master teacher Steve Kaufman (USA). The list allows you to vote for your own favourite link and push it up the list. The CCC is of course on the list; the European sites which are also there include Beppe Gambetta (Italy), the BBMA, and the Sons of Navarone (Belgium). The IBMA's World of Bluegrass 2009 will be held in Nashville, TN, from 28 September to 4 October 2009, comprising the Business Conference, Awards Show, and Fan Fest. You don't need to be an IBMA member to attend! Complete event info and a link for registration can be found here. The current issue of the IBMA's e-newsletter includes a report on EWOB 2009 by Richard Hurst, chairperson of the EBMA, with special mention of the EWOB Festival, and a link to the Jan de Mooy photos on the Bluegrass Blog, as well as other international news. Randy Waller & the Country Gentlemen playing at the Charlie Waller Memorial Concert (8 May) in the Evangelical Church at Munderkingen, Germany, during their recent tour in France, Germany, the Czech Republic, and Switzerland. This is the first item posted on the European Bluegrass Blog using the new method described on 31 May. Thanks to Sophia Johnson, guitarist of the Toy Hearts (UK) for the seventh instalment of the band's monthly bulletin. The Toy Hearts thank everyone who sent messages of goodwill and sympathy for Hannah Johnson, their lead singer and mandolinist, who was admitted to hospital early in May with a disabling illness that was finally diagnosed as a kidney infection and successfully treated. She is now fully recovered and back on top form! One show on 13 May had to be cancelled, and has been rescheduled for 14 October. The band also thanks Rainer Zellner of Music Contact for their enjoyable and well received shows in Germany. Within the next four weeks both Toy Hearts albums, If the blues come calling and When I cut loose, will be available to buy on iTunes and Amazon mp3. Both albums are currently available from the band's website, CD Baby, and Smart Choice. The band are currently working on new material for the summer festival season, with a view to recording something like an EP before their US tour in September. Full details of the Toy Hearts' schedule of appearances in Britain, Europe, and further afield are on their website, which has all the latest news about the band: gigs, venues, and releases, reviews, and biographies of band members, plus photographs, videos, and music samples. You can also buy both Toy Hearts albums, sign up to the mailing list, and more. The organising committee of the EWOB Festival at Voorthuizen, the Netherlands, has issued a release listing the winners of the three European Bluegrass Band Awards and the three Audience Popularity Awards, with photos, links to band websites, and descriptive notes. The European Bluegrass Band Awards are decided in the most idealistic manner possible: voted only by the musicians playing at the EWOB Festival. This ensures that no one else can influence the course and development of European bluegrass - no jury of 'experts', no politics. and no regional audience, just the people who make the music, choosing among themselves a band they feel will best represent European bluegrass in the coming year. This is indeed an unusual system, but we are less interested in doing things the way other events run their awards, than in creating something better for our bands. EWOB is truly all about the music! First-class instruments can still be won in the EWOB 2009 Instrument Auction and Raffle - banjos from Deering and from Capek Handmade Bluegrass & Jazz Instruments in the Auction, and a Blue Ridge dreadnought-style guitar donated by Boetzke's Snaarinstrumenten for the Raffle. Read the full text of the release here.